Def Leppard and KISS continued the Summer Tour 2014 last night in Des Moines, IA with a 14 song set played. The band played the regular 75 minute set at Wells Fargo Arena. The show started with the live snippet of 'Won't Get Fooled Again'. The rest of the show was the usual set with no changes from Minneapolis. This was another show in an indoor arena that was sold out. 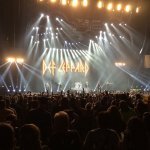 There is now just one indoor show left on this leg with KISS in Tulsa, OK next week.